Deadline for full paper submission: 31st August 2018. 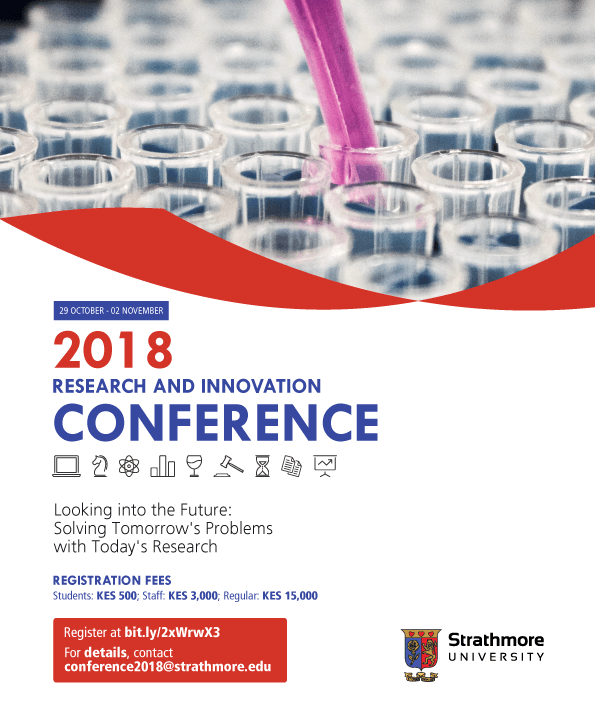 The 2018 Strathmore University Research and Innovation Conference is a premier research event that will take place in Strathmore University, Nairobi, from Monday, 29th October, to Friday 2nd November 2018. The Conference will take place in two distinct portions, one for undergraduate students and the other for postgraduate and industry researchers and innovators. Each of these portions will be organized to explore the theme along the nine multidisciplinary thematic areas shown below. Calls for papers have been made for each of the thematic areas. If you wish to submit any of them, please consult the full list of thematic areas below. The submission codes are in brackets. The organizing team invites theoretical and practical papers exploring any of the thematic areas. Submissions should be made to the email conference2018@strathmore.edu under the subject line “2018 SU Conference Submission – (Submission Code)” before or on 30th June 2018. The submission should be in the form of a .docx (Microsoft Word) document. The submissions will undergo a peer review process and the authors of accepted papers will be contacted with further details. For more details about submissions, please consult the specific call for papers for each thematic area. You may request for these through an email to conference2018@strathmore.edu. If you wish to use another payment method, please consult the organizing team at conference2018@strathmore.edu.